Join us for the next GFW PRSA luncheon, Wednesday, Feb. 13, featuring a speaker you don't want to miss! Anita J. 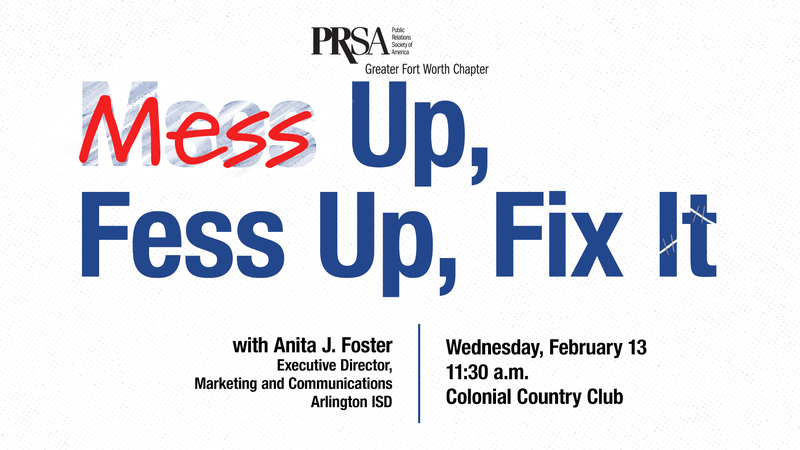 Foster from the Arlington ISD will speak frankly (and with great humor) on a topic all PR practitioners can relate to - what to do when you mess up. When a crisis hits, and it will, you need a sure-fire game plan to respond effectively and immediately. In today's world, information moves at a rapid pace so when you mess up, and you will, be ready to fess up and fix it right away! Hear from Anita J. Foster, Executive Director, Marketing and Communications at the Arlington ISD, to hear hilarious, horrifying and humbling examples of how to handle any crisis that comes your way. There's just no reason to learn on our own when we have major brands like KitchenAid, JC Penney, Egypt Air, American Red Cross and others to learn from. Be ready to laugh and cry as we walk through some classic mess ups, fess ups and fix its, and how to incorporate this strategy into your crisis communications plan.